Knee is one of the largest and most complex joints in the body. Knee joint is made up of bone, cartilage, ligaments and fluid. Muscles and tendons help the movement of knee joint. Think about a situation where the knees get damaged or injured ? Knees problems are very common, that it can occur in people of all ages. Knee problems cause severe pain and feel difficulty in walking. The knee injury can be caused by many reasons such as sudden injury, an overuse injury or by an underlying condition such as arthritis. Knee and shoulder India is a health care institution particularly dedicated to knee and shoulder disorders. Our mission is to improve and instill movement and fitness through remedial orthopedic treatments. 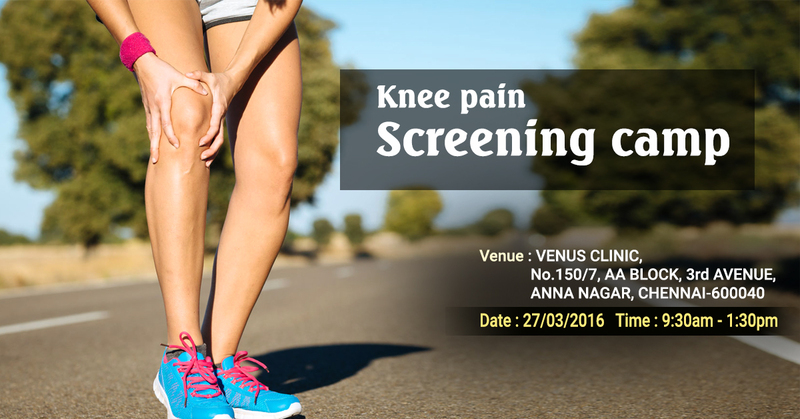 We are going to conduct a Knee Screening Camp on 27/03/2016 at 9.30 am to 1.30 pm. This camp will help you to recognise your knee problems and the type of treatment that you have to undergo. Please join with us and make it a success.